I opened the front door to the snug Red Sandcastle Theatre and saw, to my surprise, a man dressed to the nines. He was in full blackjack-dealer garb, including a crisp white button-up and a bowtie. He welcomed me to the First Show Spectacular, waving his hands like I had just stepped into Caesars Palace on the Las Vegas strip. He took a playing card out a pile, snipped it in half, and handed it to me. I’d never had a headless Jack of Hearts as a ticket before. If anything, I was impressed with Gambler Productions‘ dedication to a theme. First Show Spectacular is a one-hour production of two half-hour plays: The Waiting Room by Jen Farr and Your Path To Happiness by John Rowntree. The program states: “One play isn’t enough to contain our excitement, so there are two in tonight’s show.” Both plays are solo performances, written by their star actors. The first show is Waiting Room, an amusing play about a woman named Wanda, who occupies her time in the waiting room of a doctor’s office by people-watching. She makes snap-judgments of any one who crosses her path, whether it’s worn-out nurses or adorable little children. Wanda’s anecdotes and observations are interrupted by dramatic moments of pain, making you wonder about what lies beneath the surface, of the comedic play and more practically speaking, with her abdomen. Jen Farr is best when she adds seriousness into the show, interrupting her snark with moments of anxiety. These additions turn the character Wanda from a rolodex of criticism into a genuine person. She gets to the real underlying fear that goes to visiting a doctor, the terrifying “what if?” that plagues our mind. Wanda’s invading thoughts impressed me more than the complaints about the overworked nurse or lovey-dovey couple, even if though they were funny. I felt that Farr sounded more natural during these heavier moments. Wanda felt less like she was doing a performance, and instead tried to have a heart-to-heart with the audience in front of her. At times, Farr’s comedic delivery felt too campy, which didn’t mesh with the story. I couldn’t put my finger on it for a second, but then I realized she occasionally sounded like Ace Ventura (played by Jim Carrey). It was obviously unintentional, but incredibly distracting. The second show, Your Path To Happiness, is about billionaire and capitalist mogul Gary Maitland, giving a presentation about the meaning of life. John Rowntree struts on stage in a full suit, dripping with ego. He practically slapped me in the face with his smugness, bragging about his custom power suit and his ludicrously expensive watch. He was the smarmy TED-talks of my nightmares, complete with cheesy PowerPoint presentation. I was immediately hooked to Rowntree’s shtick. His impression of rags-to-riches advice was spot on, to the point of making me uncomfortable. Your Path To Happiness is a harsh commentary on capitalism and the people who gravitate to it. On another level, it’s also a story about a man who lets his ambitions rule his actions. I was genuinely shocked at how far this show went. I won’t spoil anything. All I will say is that Rowntree holds no punches. I was left completely speechless. First Show Spectacular presents two unique shows, that have different styles of comedy and very different characters. It has the ultimate benefit of getting two shows for the price of one. I’m not going to make a horrible pun about the theme of gambling, but it’s important to point out that it’s a great deal. All in all, I thought it was a nice way to spend an hour. 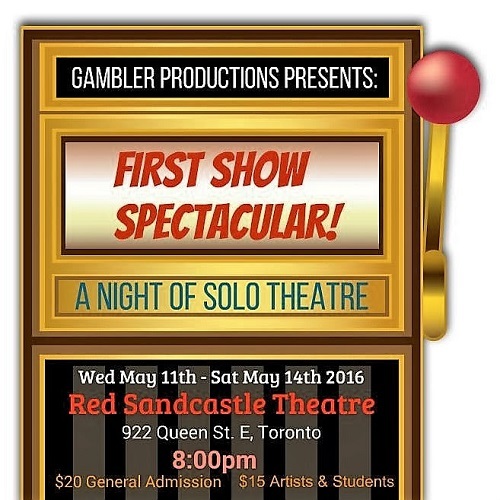 First Show Spectacular is playing until Saturday May 14th at Red Sandcastle Theatre (922 Queen St. East). The final showtime is on Saturday May 14th at 8:00pm. Tickets are $20 for general admission. Artists and students can purchase tickets at $15. Tickets can be purchased at the door.